Welcome to another edition of Blogging Marathon, we are running the 7th this month. I have along with me, 23 bloggers doing the two week long Marathon. I have spent considerable amount of time thinking over the themes, so I hope you enjoy them as well. These are the themes you will be seeing us blogging for the next two weeks. For the first week, I have chosen Cooking from the back Pack. Over the years I have saved up so many cut outs from food packets, ingredients, masala packets etc. On many occasions, I have written down the recipes, but after a while I started saving up the clippings hoping to cook from them and keep or discard based on the results. If you want to have an idea on how vast my recipe collection based on these paper backs or pack recipes, read on my recipe collection. But for this theme, I wanted us to concentrate mostly on the pack backs. So now I have the opportunity to browse through the collection I have. I have collected many such papers from milkmaid, cocoa, macaroni etc. But I also wanted to make sure I don’t repeat the main ingredient or the packet. Like there is no point if I make 7 different recipes from Milkmaid back recipes using condensed milk. So I have tried my best not to repeat the ingredient, and selected different recipes with different main ingredients. Hope you will enjoy as much as I enjoyed making them or my family eating them. The first in the series is made with corn flour as the star. My stint with corn flour started during my college days when I was making American Chopsuey very frequently. Those were the days when Cauliflower Manchurain or homemade soups were a hit. 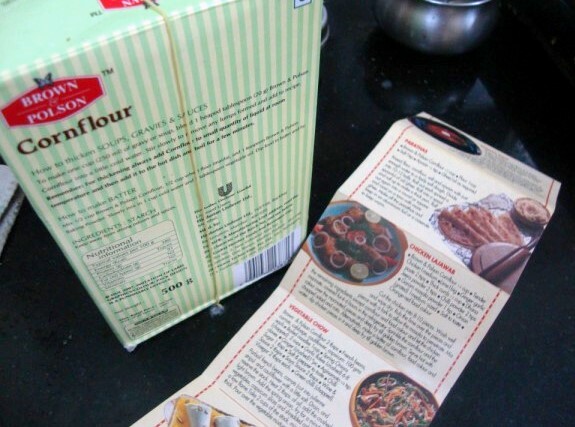 Amma used to buy the Brown & Polson brand most and the recipes are listed at the back. They also give about couple more recipes. I have collected so many of these and always wanted to try. I was really happy finally making something from it. For the second week, I have selected to do Crunchy Snacks for Kids, as Gayathri is hosting the Kid’s Delight event themed on Crunchy Snacks. Memories are really something, they make you feel light and carefree. Like I visited Konda’s sports day function at her school. She was getting a gold medal. Seeing all those kids, yelling, running around, made me remember my own school days. Just yesterday I was talking to my schoolmate who studied with me since class 5 and we were remembering our own school days and now we have kids of that age. I know I sound so cliched, but where did the days vanish. The memories are still so fresh. At times I feel it’s a big play that I am watching, and I am going to wake up and get ready for school! Close and roll out again as a disc. 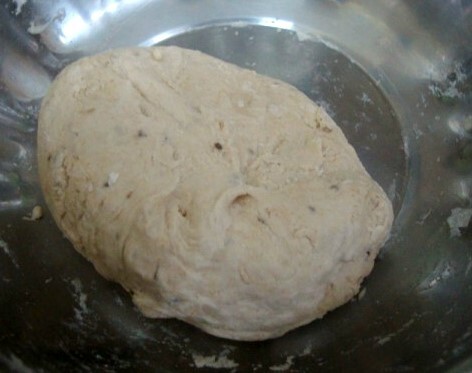 In a bowl, take all the flours, ajwain, salt and with water knead to a soft dough. As you do your regular parathas roll out as a disc. 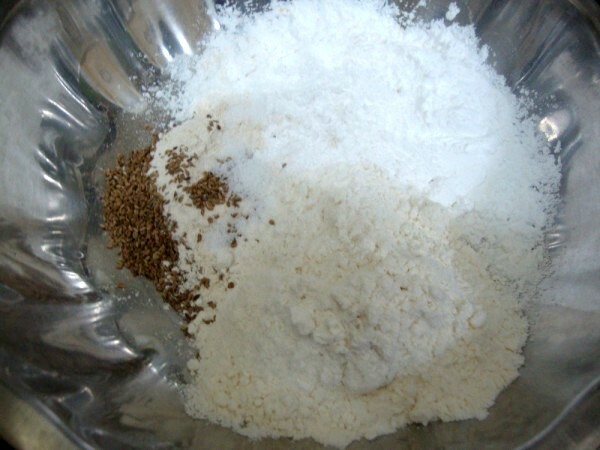 Apply ghee on top, fold into a triangle or into pleats and roll out again after dusting with flour. 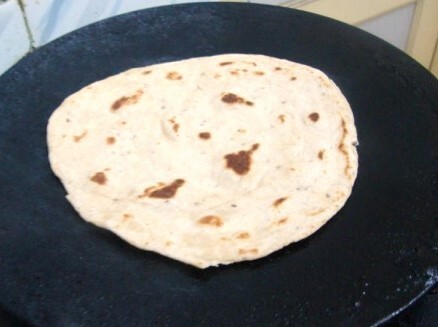 Heat a tawa and cook the parathas on both sides. Notes: The recipe called for complete flour, so I made it healthy by adding more atta than maida. I love ajwain as adding that gives a whole new taste, I add it to puris, samosas etc. 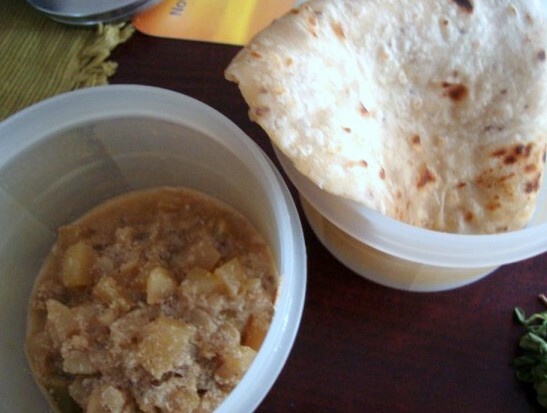 Parathas look perfect.. Hope you got my second entry for the sandwich event.. This looks like one I would like to try cooking. I reckon my husband would like them a lot. Great photos too! Parathas look so soft and tasty. I like the flavor of ajwain more than cumin. 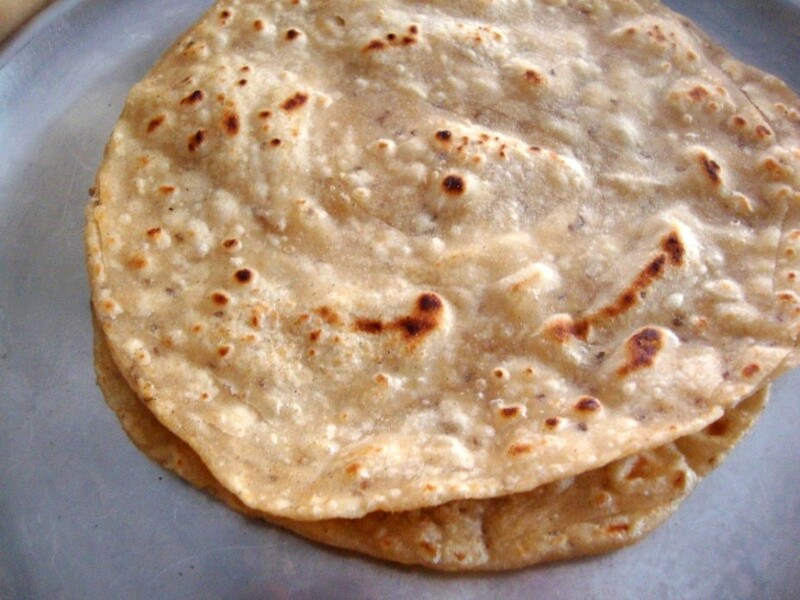 I have made parathas by adding various flours but has never tried with corn flour. Sounds interesting. Sounds interesting! I have never made parathas out of cornflour. You surely have a unique hobby of collecting the recipes from the packs! adding corn flour sounds new…but I usually make ajwain parathas..cos it's nice for cold, congestion and best way to make kids eat. very interesting Valli — cornflour to Parathas..
Corn flour is really interesting twist. My MIL also makes these parathas. She has an interesting technique though..she crushes the ajwain seeds along with a pinch of sugar and cumin seeds in a mortar before adding to the parathas. I will pass back the corn flour tip to her. 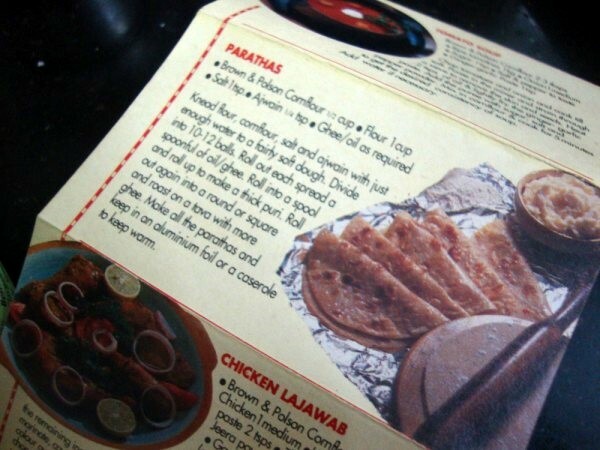 Never have i tried parathas with cornflour..this looks interesting and the parathas looks just great !! Very nice step by step procedure! Sounds like a new type of paratha. 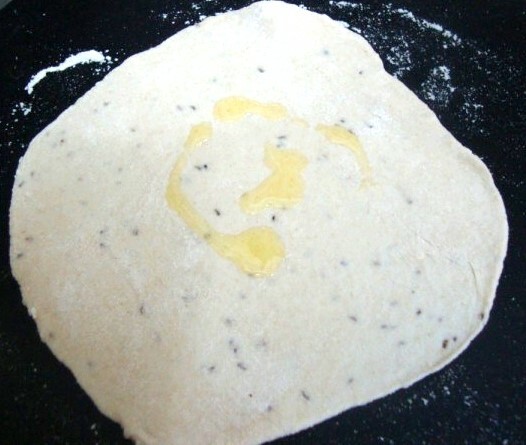 I use Ajwain in most of the dishes, but never tried in a paratha. Looks fantastic! Hey Srivalli! Am totally impressed by your blogging marathon 🙂 all the best.. im looking forward to all the dishes. My mom-in-law makes amazing Ajwain ke Parathe. But only with wheat flour or atta. 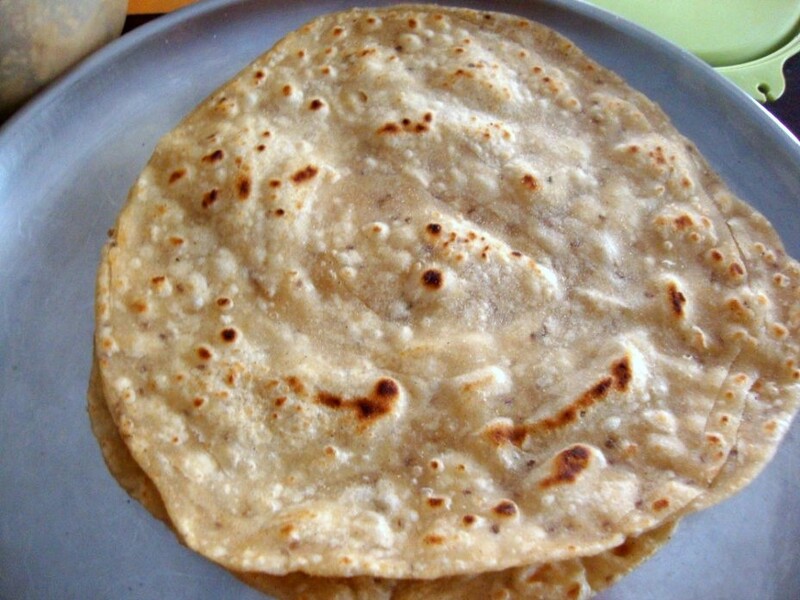 And her trick is to roll out the plain dough into a chapati kinda shape first, then sprinkle salt and ajwain on the disc, then fold into pleats and roll out again. Try it some time! Wowww… So simple and delicious recipe.. looks absolutely perfect.. thanks for the recipe dear !! Corn starch in parathas is new to me.. Ajwain flavored parathas look yumm. Looking forward to your back of the pack recipes. 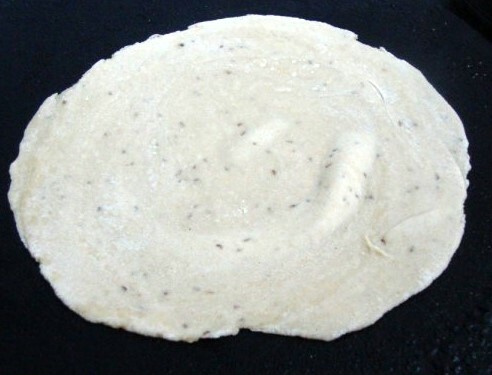 I make the regular wheat rotis with ajwain. Your addition of corn flour to parathas is somewhat new to me.